Are you trying to lose weight and cut out the carbs from your diet? Well I am but it’s hard to be a food blogger when you can’t eat anything. The biggest challenge to eating low carb is replacing the bread. Even bread crumbs are a no no. So in order to continue eating some of my favorite foods I had to find an alternative. And I think I’ve done a good job with this one. 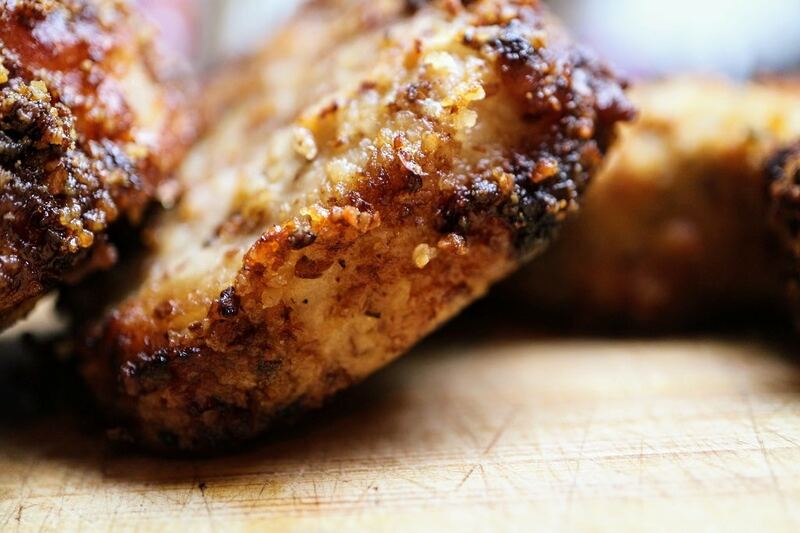 Here’s my recipe for low carb pork chops in the air fryer. My wife’s friends at work have been raving about the new air fryers they got for Christmas. I heard all the stories about how they can cook burgers in minutes, fries taste like they were deep fried with only a tablespoon of oil and the you can make healthy chicken and broccoli without calling the Chinese food place. Since we’re well known fans of kitchen gadgets we immediately purchased a Cozyna Air Fryer from Amazon. We picked the big family sized one that has a capacity of 5.7 Quarts and has a touchscreen. In two days we were air frying all kinds of stuff. I should really do a formal review of this product but my unofficial review is – it’s awesome! The grilled cheeses and the quickly heated frozen foods that taste so much better than if they were microwaved were very exciting for the kids. But for me and my wife, the about 50 year olds who are trying to stay healthy and lose weight, the frozen food and sandwiches weren’t going to cut it. We needed low carb and healthy things to try. Some of our first experiences were sweet potatoes, air fried broccoli and low carb pork chops in the air fryer. The sweet potatoes were excellent, the broccoli was so overcooked (my fault) we threw it out and the pork chops were outstanding. They were so great that I just had to share the recipe here on my blog. The key to low carb breading for a pork chop is to not use bread crumbs. 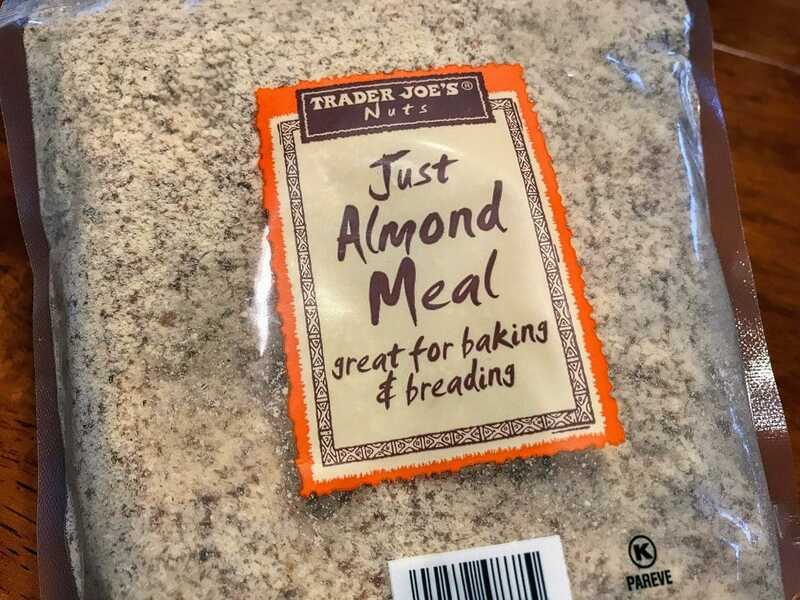 And while I was browsing around Trader Joe’s I found a great substitute, Almond meal. 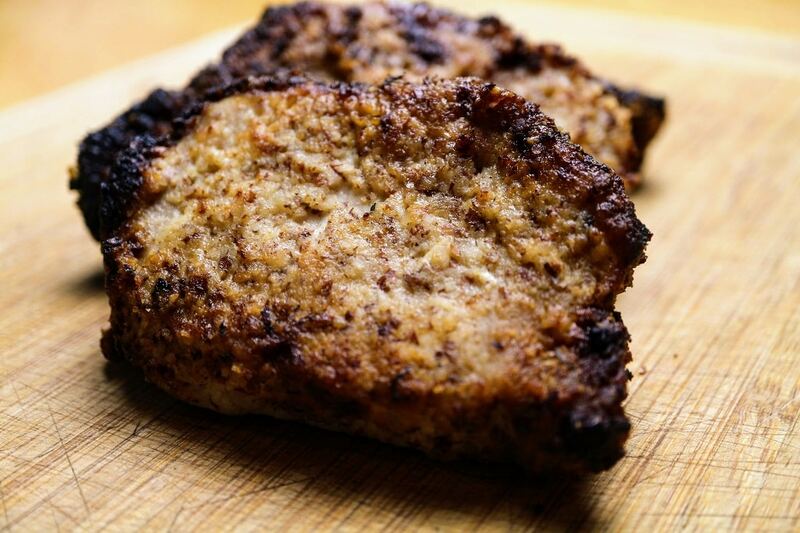 My wife and I both love roasted almonds so I’m familiar with the flavor and it just seemed like it would be perfect for the breading in a pork chop. I did a quick search on my phone for almond meal pork chops and saw that other people have tried this combination with good results. The bag of almond meal was in my cart and I got out of there quickly because I was anxious to it try out. I seasoned the almond meal with a little garlic powder and onion powder, added some kosher salt and then the key flavor addition was Parmesan cheese. Cheese makes everything taste better. Once the “breaded” pork chops were in the air fryer I selected 400 degrees for 12 minutes and gave them a spritz of olive oil. Half way through I inspected the pork chops and they looked great. Nice and crispy. I gave them a flip and let them finish cooking. After 12 minutes the pork chops looked just like regular breaded high carb pork chops. And you know what? They also tasted just as good. I really couldn’t tell the difference. And you know how those healthy eating bloggers are always saying “You won’t be able to tell the difference” and then you make their recipe and holy cow there’s a huge difference. Sorry but these Kale chips do not taste anything like Pringles. There should be a law against getting your hopes up when it comes to dieting. But hey, I’m not a healthy blogger. Remember I’m the guy that wrote a panini cookbook with recipes that included baked ziti panini and a baloney on corn bread panini. I actually wanted to call that one “The Redneck Sandwich” but my publisher wouldn’t let me. Anyway, these Low Carb Pork Chops in the Air Fryer are delicious. No joke! The almond meal has only 7 grams of carbs per serving (1/4 cup) and also have 4 grams of fiber for net carbs of 3 grams. The recipe below calls for 1 cup of almond meal but not that much actually gets on the pork chop. 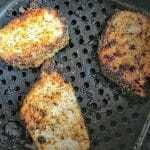 These pork chops are low carb because the breading is made with almond meal and Parmesan cheese. And the air fryer keeps them from getting too oily.